As the SDSR 2015 fog clears it appears the current generation Type 23 frigates of the Royal Navy will be replaced on a one-for-one basis, but not quite the way that was expected. And there are likely to be even more frigates on top of the 13. Cries of the frigate force being cut even further do not hold water…something very unusual after a UK defence review. 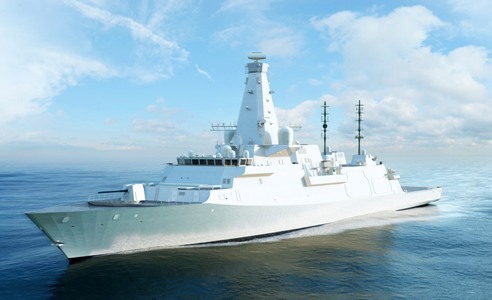 The announcement that there will be eight Type 26s built proved especially controversial in Scotland, home to the surviving UK shipyards that build major surface combatants for the Royal Navy. The ruling Scottish National Party (SNP) accused the Westminster government of betraying Clyde shipyard workers, as it has not confirmed an order for 13 of the Type 26 Global Combat Ship (a fancy name for a frigate). However, Mr Cameron, in speaking to BBC Scotland, said “at least another five” light flexible frigates will be built, but not, so it appears, if the Scots vote to leave the Union after the Type 26 programme concludes. It is important to understand that the Royal Navy has always been looking at various types of new vessels to replace the Type 23s: A high-end ship (which turned out to be the Type 26); a simpler patrol vessel (Mr Cameron’s ‘light flexible frigate’ – in essence a more basic Type 26? ); plus another vessel type to carry out the roles of patrolling, mine-hunting and even hydrographic survey (depending on mission modules fitted). This is what seems to be happening and the decision to make the eight Type 26s Anti-Submarine Warfare (ASW) ships mirrors the state-of-play in the Type 23 mix. Nine out of 13 Type 23s possess a higher level of ASW capabilities, the other four being more multi-role in function. Eight of the Type 23s, of both varieties, are decommissioning between 2023 and 2030 and these will be replaced with the Type 26. The remaining five seem likely to be replaced by the ‘light flexible frigate’. This opens up the possibility of the baseline level of 19 frigates and destroyers being increased to 25, composed of 19 frigates (of all kinds) and six Type 45 destroyers specialising in Anti-Air Warfare (AAW). This was where the Royal Navy was about a decade ago, so it is a case of rewind, but it is reckoned the UK actually needs 30 destroyers and frigates to cover all bases operationally. When it comes to HMS Ocean – the Royal Navy’s sole surviving operational carrier of any kind at the moment – the fact that she is to probably decommission in 2018 was not explicitly mentioned in SDSR. A clue that her time is limited has been provided by a MoD graphic showing the assets the Royal Navy will possess in 2025. This did not include a purpose-built Landing Platform Helicopter (or LPH) which means Ocean will not be part of the fleet. This was not a surprise, as the same graphic indicates two new Queen Elizabeth carriers are in service by 2025. It has long been suggested that one of Queen Elizabeths will perform the LPH role while the other is committed to being a strike carrier (a pattern followed by the old Invincible Class carriers in their latter years). SDSR 2015 confirms one of the new carriers will be specially adapted to act as an amphibious assault carrier. When Ocean emerged from her last major refit in the summer of 2014 it was no secret that her out-of-service date was to be 2018, though there have recently been suggestions she may serve on a little longer than that. HMS Queen Elizabeth is to commission in 2017, with potentially an LPH function possible by 2018 when Ocean is currently destined to go out of service. Her original service life was meant to be 15 years, which suggests Ocean should have been decommissioned in 2014. There were hopes she would be replaced with a dedicated LPH, ensuring the two Queen Elizabeths could be restricted to the strike carrier role. This will clearly not happen. 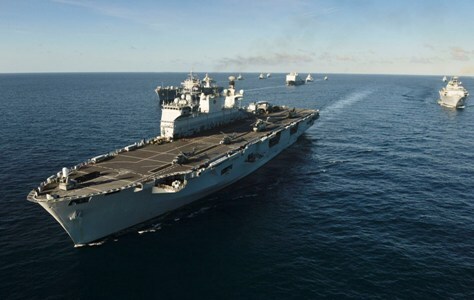 It is interesting to see that the RN is intending to have the two major amphibious ships Albion and Bulwark available by 2025 to provide task group options. At the moment only one of the Landing Platform Docks (LPDs) is available for operations, so with luck, and an injection of more personnel, could both be maintained in service? Perhaps they will switch the Ocean’s crew to one of the LPDs rather than to HMS Queen Elizabeth? There are many pieces to move around on the Royal Navy’s chessboard to try and achieve as much operational capability as possible in an era of restricted resources, especially when reaching for expanded capabilities with new strike carriers and submarines. Top – A recent CGI depiction of the forthcoming Type 26 Global Combat Ship. Image: BAE Systems. HMS Ocean leading a NATO naval task group during a massive exercise off the coast of Iberia in October (with HMS Bulwark off her port quarter). Photo: LA (Phot) J.J. Massey/Royal Navy.